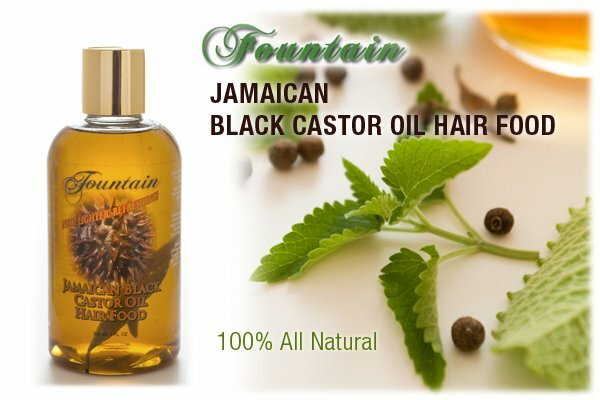 Jamaican Black Castor Oil has many varied cosmetic uses for the hair, skin and face. It can be used for hair growth, as a skin moisturiser, to grow eyelashes and can even be used to treat acne. A preshampoo treatmnet ( sometimes called a pre-poo) can be done with Jamaican Black Castor Oil . 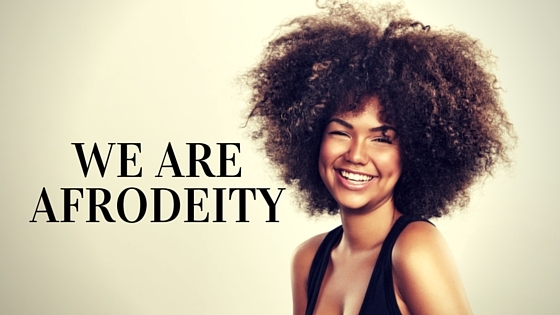 Those of us with naturally dry hair which is more sensitive can experience dry scalp issues. A pre-shampoo oil treatment will protect your hair from being overly cleansed by the harsh chemicals in mainstream shampoos and being too clean. Over cleansing your hair with a harsh SLS shampoo can remove the small amount of natural oils our hair already has. Applying oil to your hair before washing can help with detangling before washing it. Main stream conditioners for dry hair are usually made with either natural or synthetic oils. Oils are attracted to each other. The oils left over from your pre-poo will help the oils in your conditioner stay on the hair and take effect. Prior to cleansing or shampooing the hair, apply a generous amount to the hair, root to tip and the scalp. Massaging into the entire head. Use small amounts of Jamaican Black Castor Oil by Massaging the oil into your scalp daily. An applicator bottle can be an excellent way of getting this oil to the oots of your hair, particularly for those with thin hair or very long hair. Apply to a clean scalp. Applying the oil to a dirty scalp can hinder rather than encourage growth as bacteria and funghi wil flourish in a dirt and oil. Apply to freshly or at least recently washed hair. Make sure to adopt a good wash regime and wash this oil out of your hair every few days especially if you are using the 100% pure oil. Apply Daily to the temple or crown area to help soften the hair. This part of the hair is very prone to breakage from daily styles like a slicked back pony tail or excessive combing. Castor Oil is a humectant and draws moisture into the hair strand. The dry hair on he temple and crown will benefit from a little extra maintenace by applying this. Apply a small amount to the strands to give the hair a little added shine! This treatment is best done when ou have time, on a Sunday afternoon. Place the oil in a sink with warm water, this will slowly heat the oil. You do not want it to be too hot as it will scald you on application. Massage a generous amount of the oil thoroughly into in your hair and scalp so that all your hair is exposed to the oil. Put plastic cap on your head and wrap a warm towel around it or sit under a hair dryer if you have one available for 15 – 30minutes. Add a tablespoon of Jamaican Black Castor Oil to your deep conditioner as a moisturising agent. Mix with Grapeseed or Jojoba Oil so it is not as thick. 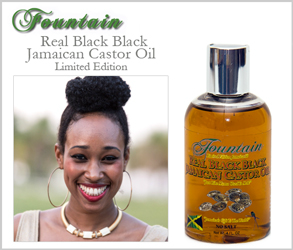 Foutain Jamaican Black castor Oil is a wonderful leave in and is great for his purpose and also has a refreshing odour. Protecting Your Ends Pre Relaxer (Chemical Processing). This helps prevent overprocessing as the hair is coated and protected by this thick oil. Prior to the relaxing process. Apply a genrous amount of the oil to the parts that have already been relaxed or chemical processed. 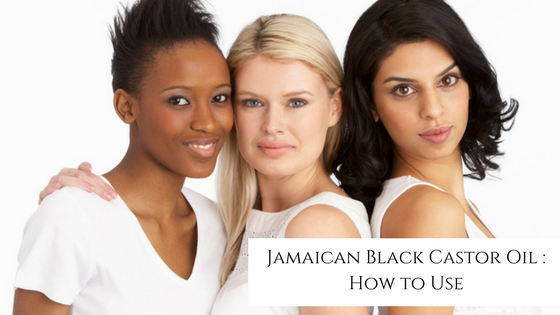 Jamaican Black Castor Oil can also be use to help your eyebrows and eyelashes to grow. You may need to re grow your eyebrows after years of over-plucking or you may feel that you could benefit from thicker eyelashes. Try Only use the 100% pure oils for your eyebrows and eyelashes. Try not to get this in your eyes as this can cause irritation. This must be done carefully. Apply a little of the oil to your eyebrows or a very small amount using a cotton bud to your eyelashes before bed. DO this as you would for applying any type of eye makeup, but do so as not to get it in our eyes. Use a clean tissue or cotton bud to remove any excess oil. Jamaican Black Castor Oil can also be used to treat acne. Jamaican Black Castor Oil has been known to help reduce sebum production which is linked to the causes of acne without drying out your skin. Here is a simple method for those of us with busy schedules. When you wake in the morning your skin should have absorbed the castor oil and it should not feel greasy or oily. Both Ylang Ylang and Tea Tree are effective essential oils for treating acne. (Other oils are neroli and patcholi) Ylang Ylang is effective in treating greasy, oily skin. It reduces oil production and fights bacteria to reduce and prevent the appearance of blemishes and acne. Tea tree oil is an antibacterial and antimicrobial oil that works to clear acne by killing off the acne-causing bacteria and microbes on the skin. It is best to dilute tea tree oil to 5% as it is quite a strong astringent. Doing the treatment above with the Ylang Ylang JBCO and then using a moisturising tea tree face wash the following morning could be helpful. If you are still experiencing problems it is probably best to see a dermatologist if your acne is severe.